Snoops and Kommando Kitty here. Welcome to another edition of Cat Forum. This month we’re talking to Bertie. We liked him the first time we met him. He has cattitude and a great personality. He’d fit right in here at Cheeseland. You can read more of his adventures at Bertie’s Blog. Not much is known about my history because I haven’t told anyone. It has left me with abandonment issues and I am always scared that I shall be left behind the way my previous family did. Because of this I asserted myself very early on. I didn’t care for the humans who called themselves Ma and Pa. I wanted to know what the outside space consisted of, how many houses I could go to try and get food from should the same happen again. 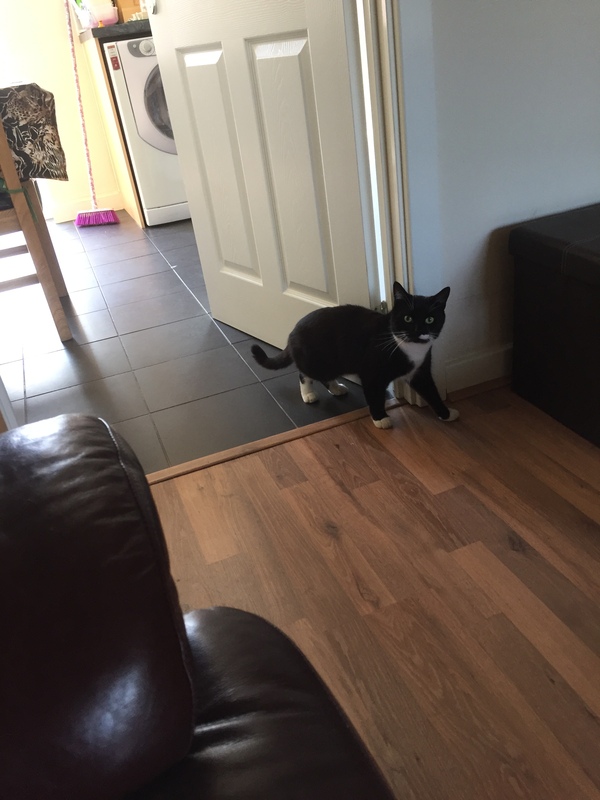 Of course now I’ve been here for nearly 12 months and I don’t think Ma and Pa will leave me but I do have next door to go and visit… I haven’t paid rent yet for their’s but I do consider it my second home, as you can see me sneaking in in the photo. You’re pretty new to the blogging world; how do you like it? I am still finding my way a little bit. 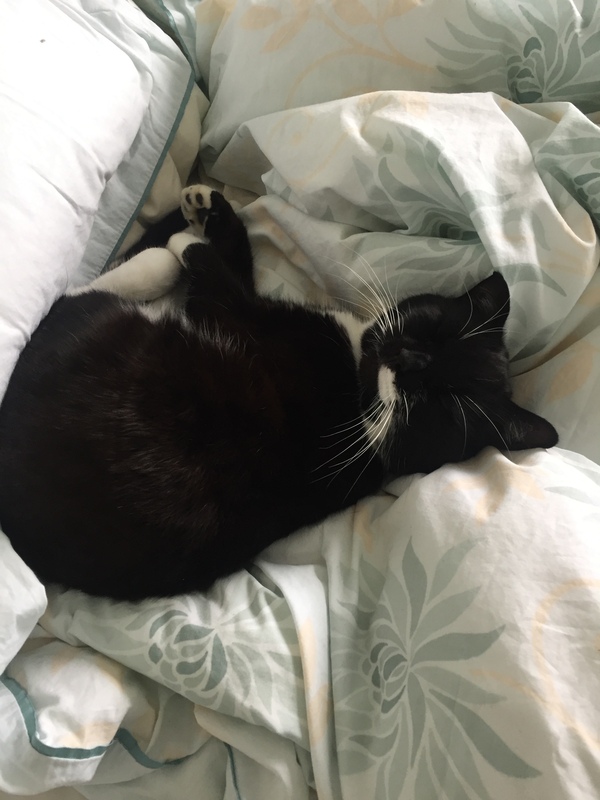 I tend to be very busy so don’t always get the chance to write or comment on blogs as much as I would like to – sleeping and catching mice is very time-consuming. 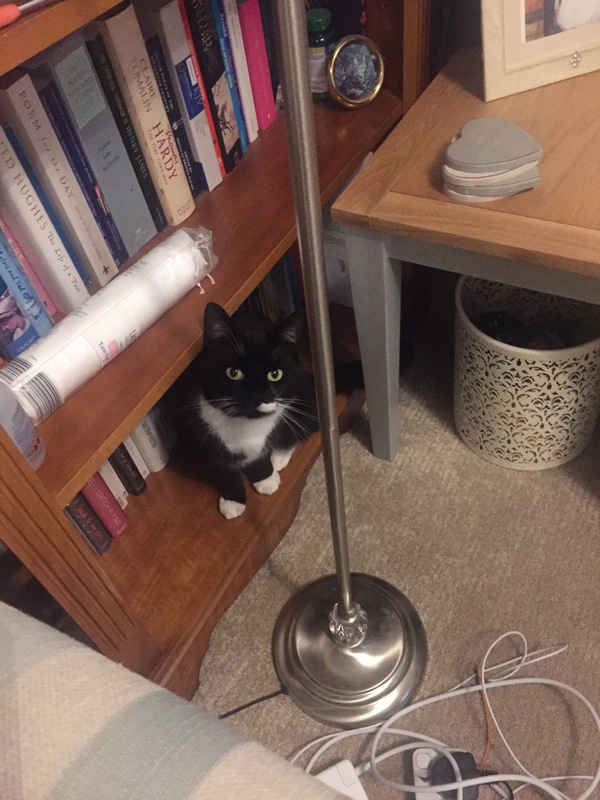 Do you have any non-human housemates or just the humans? Could you tell us about them? It is only me here. I wouldn’t mind a companion as I’m a sociable chap. My cousins live next door who I visit frequently but they don’t like me. I was there yesterday actually. I snuck in and ran upstairs. Mo was under the bed so I joined him. Joe fights more than Mo (Mo is just a scaredy-cat) and he came to find me. He stood at the top of the stairs so I couldn’t get out. The humans decided to leave us to it. I could hear them chatting in the living room. I made a run for it. First Mo ran down the stairs and then Joe ran. At the bottom they decided to fight each other and hiss. I found this rather amusing as they are brothers and thought they were fighting me but they got confused! Other than that I just have Ma and Pa. Ma is at home most of the time. She is neurotic. The best thing about that is when she changes the bed linen, I can hear her sniffing the air and taking delight in the new fresh smell. I go out and get my legs soggy in wet grass and then come home and jump on the bed… I don’t just find one place on the bed I walk all over it. It’s simply purrfect! I love sleeping best and of course catching mice. 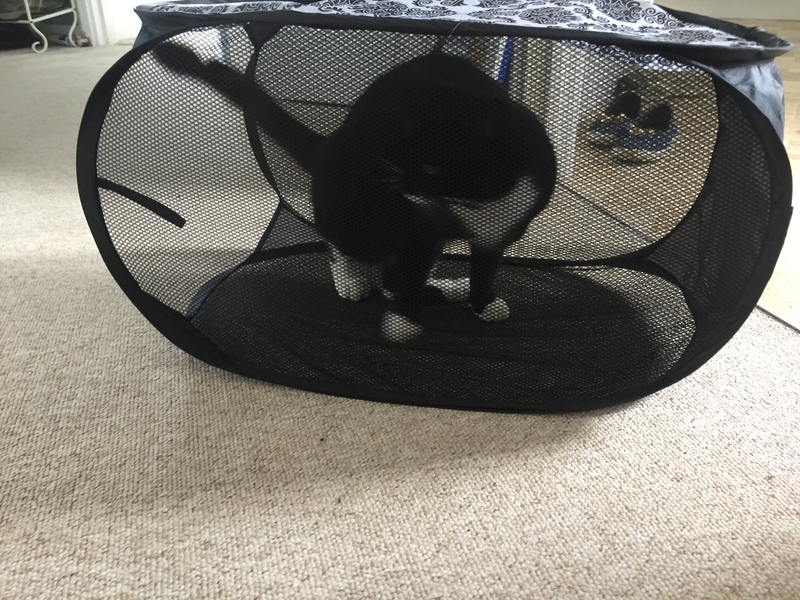 I do also like to get into places I shouldn’t be – like the laundry basket which I knock down and then get inside. Do you get to roam the yard or do you prefer cat TV (window watching)? Oh my days, I HAVE to have access to outdoors. Ma will tell you that just 2 days after taking me home I had actually escaped. I had even pulled the screw caps off the catflap (I clearly need a job in construction as I’m good!). That first time I got out was early Nov 2016. The sun was shining. I breathed the fresh air, and then ran and ran. Over the fence I went, and over another and another. The freedom was amazing! And then I bumped into a grey little fella called Sydney. Friend or foe? He had to be friend, surely, and his home looked nice. So I sat in their driveway and stared at him. I also used the cut out hole in the fence to get into his garden. 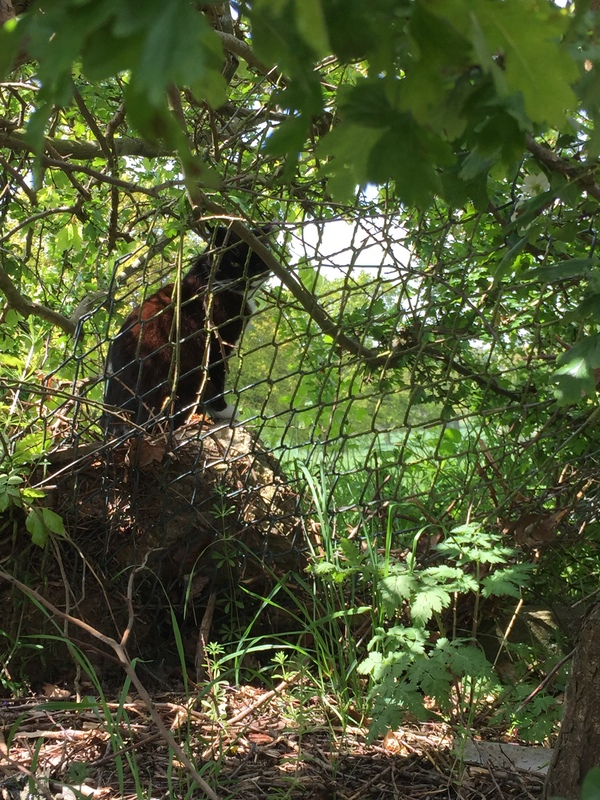 His name is Sydney and I was waiting for him to relax so that we could have a chat – he could tell me about this new area – but the next thing I knew Ma was shouting at me and running towards me. She even went into the house and into the garden. I hid! Ha! Eventually I sat at Sydney’s wall at the front and I could see Ma 4 houses down but I looked away. I would hear her coming and run at the last minute. I didn’t realise she had taken her shoes off and was treading lightly with bare feet. Before I knew it, she had grabbed me. I cannot tell you the disappointment I felt. I’m a lot more laid back now though. What do you like to do with your human(s)? I’m a very chatty boy. I always have been. As soon as I hear Ma and Pa I chirrup and chat. I come to the door whenever they arrive home. I also like to be in the garden with ma. However, I also love to cause trouble for them. When they are watching tv in the evening and I want to go outside I shall bang the catflap in the backdoor until they get up and open the front door. I like bringing mice home. It’s not a gift I just want to show them what a clever boy I am. As soon as they open the door I know it’s my cue to take it out the front. Do the humans understand that we cats are the superior species or are they still being trained? I think I have got the humans pretty well trained. They come at my beck and call. The only thing I haven’t got them trained in is giving me the correct food. I refuse to eat their food a lot of the time. They empty my bowl and put more food down. But it’s no better!! Why can’t they give me live mice so that I don’t need to go out and catch them? Do you have special treats or toys? I love my Dreamies biscuits. 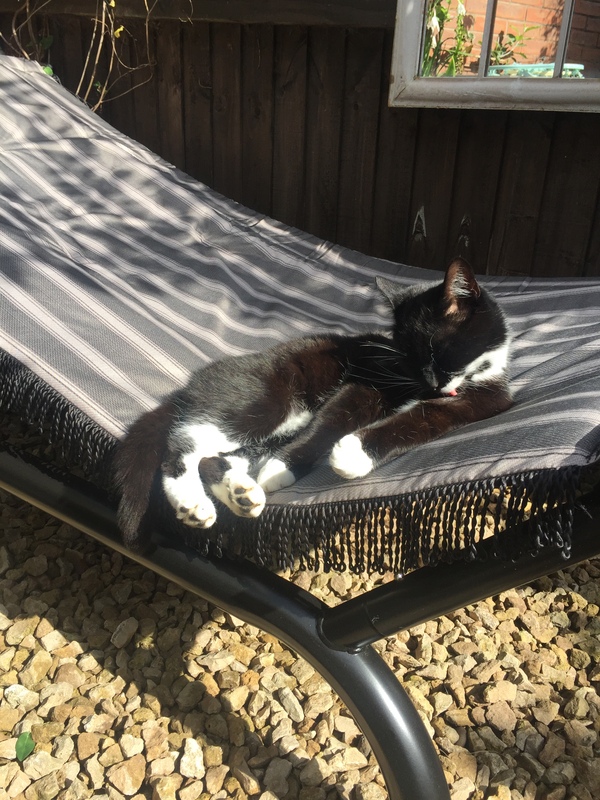 I also love my hammock which was placed there specifically for me. Where’s your favorite spot to sunbathe? Anywhere there is sunshine. I’m not fussy at all. 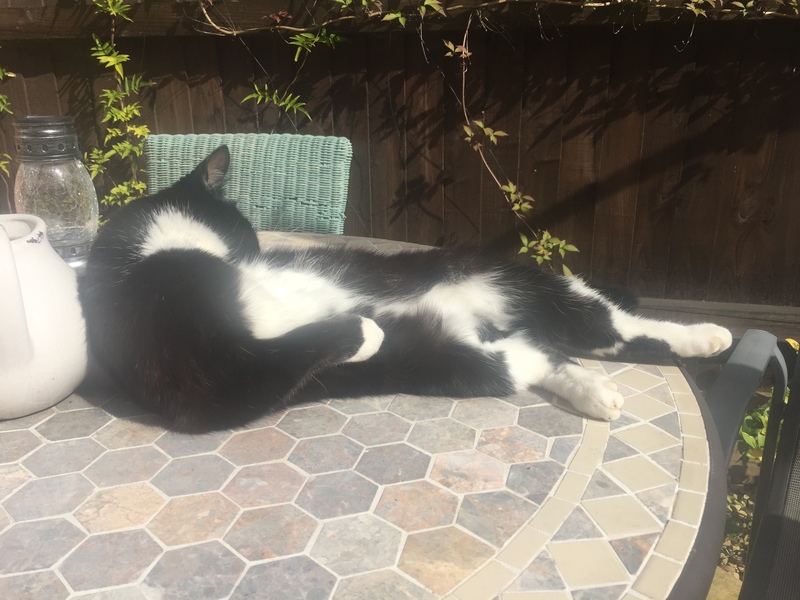 I’ll even bathe on the patio table. I’m learning human speak. I study as much as I can but it is difficult. Sometimes I give up and just purr instead.